Animal prints are a great exotic twist on handbags. But animals actually printed on bags? I'm not exactly sure how I feel about this trend. 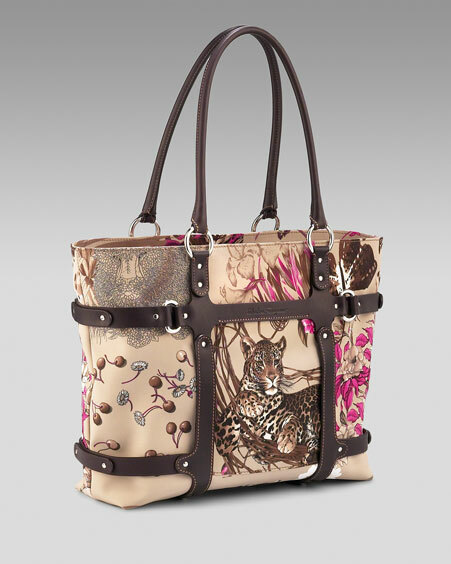 Here we have the new Fiera Carnival shopper by Salvatore Ferragamo, which features a sitting tiger in the front. Not only does this bag depict a ferocious wild creature of the jungle, but also features a floral theme with a touch of bright pink. And as seen, the exterior is partially surrounded by chocolate leather trim with slight silver toned brass hardware detailing while the sides are belted with small silver rivets. I'm not sure how I'd even pair this to what I normally wear. Don't get me wrong because I love exotic prints, including tiger. But I'm just not feeling this trend, as it's too busy and not appealing to me. It reminds me of some no name brand bags that I’ve seen at stands in the mall. And with a price tag of $940, this one can definitely stay on the display shelf. Anyways, the shopper is at least roomy measuring in at 10 1/2"x 12 1/2" x 4 1/4". The interior has a canvas lining and there is also a pocket for your cell. But overall, the animal-printed-on-a-bag concept isn't one that's making it's way into my collection of handbags. Last edited by Alicia; March 10th, 2008 at 08:28 PM. I'm not a fan of the animal design.